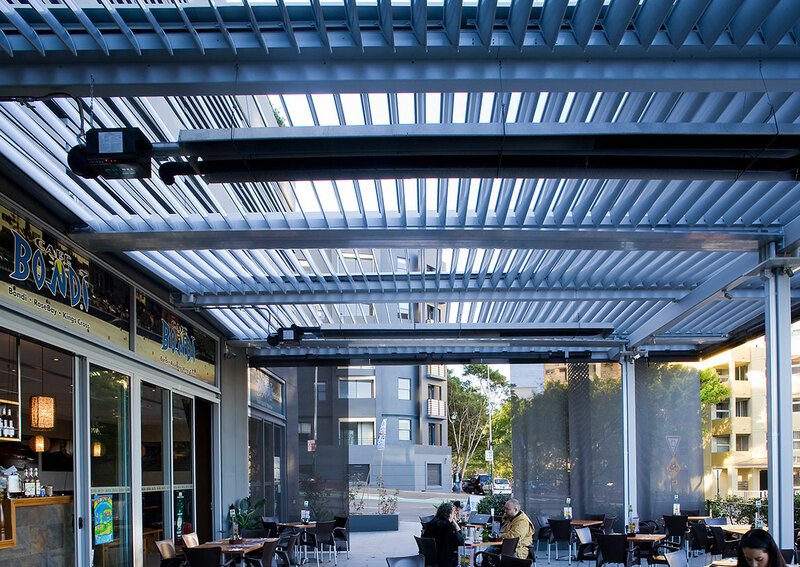 The SkyMax Aerotech Opening Louvred Roof System was successfully integrated into Café Bondi’s recently completed refurbishment, located on the upper deck area of the Altair apartment complex in Kings Cross. Patrons now enjoy complete rain protection with the flexibility of controlling sun, light & ventilation. The SkyMax team was commissioned for the installation of the motorised Aerotech Opening Louvred Roofs, the system offers a functional solution against the elements with the inclusion of the integrated heating, lighting and side-blinds that provide year-round comfort. All SkyMax Opening Louvred Roofs are commercial grade quality and are manufactured using the latest non-corrosive raw materials, ensuring hassle-free operation over the entire life-span of the system.